Our monthly mini-litter pick-up is THIS Saturday, Sept. 27. We’ll meet at McDonald’s for breakfast/coffee at 9:00 AM, and then fan out between 9:45 and 10:00 to clean up for an hour. CBC has a pretty comprehensive election site, including a ‘riding talk’ bulletin board. Click here to access. Conservative Candidate Reed Elley’s office is in Ladysmith; contact number is 1-866-668-Reed. 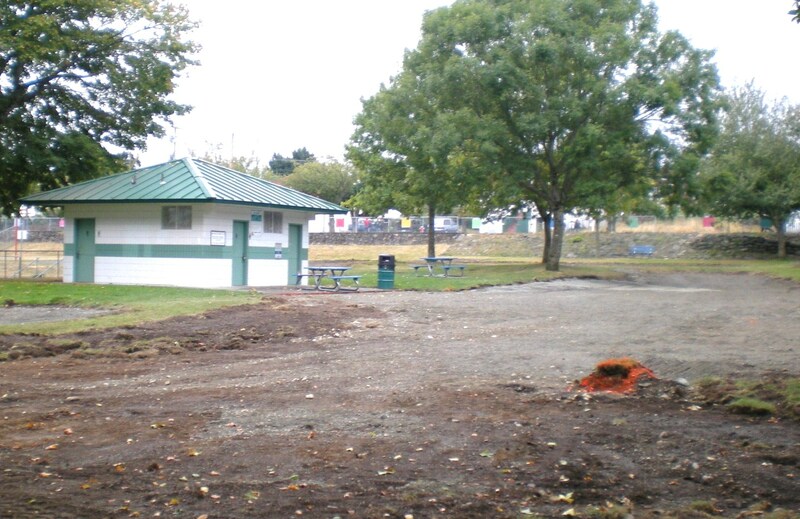 The washrooms in Deverill Park are lonely, now that all the playground equipment has been removed. The new equipment is here and should be in place this fall. The Gyro Club has generously donated $10,000 toward park development. A huge THANK-YOU from all of us in the South End! The Neighbours of Nob Hill installed their new playground equipment this past weekend, with 35 people showing up to help. Well done!